Check the tire’s tread for treadwear indicators. If the indicatorsshow, replace the tires. 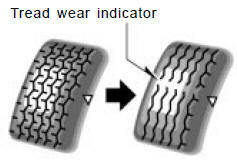 The locationof tread wear indicators isshown by the “TWI” or “D” marks,etc., molded on the sidewall ofeach tire. The tires on your Toyota have built−intread wear indicators to help youknow when the tires need replacement.When the tread depth wears to1.6 mm (0.06 in.) or less, the indicatorswill appear. If you can see theindicators in two or more adjacentgrooves, the tire should be replaced.The lower the tread, the higher therisk of skidding. The effectiveness of snow tires islost if the tread wears down below4 mm (0.16 in.). If you have tire damage such ascuts, splits, cracks deep enough toexpose the fabric, or bulges indicatinginternal damage, the tireshould be replaced. If a tire often goes flat or cannot beproperly repaired due to the size orlocation of a cut or other damage, itshould be replaced. If you are notsure, consult with your Toyota dealer. If air loss occurs while driving, do notcontinue driving. Driving even a shortdistance can damage a tire beyondrepair. Any tires which are over 6 yearsold must be checked by a qualifiedtechnician even if damage is notobvious. Tires deteriorate with age even if theyhave never or seldom been used.This applies also to the spare tire andtires stored for future use. When replacing a tire, use a tire ofthe same size and construction,and the same or greater load capacityas the originally installedtires. Using any other size or type of tiremay seriously affect handling, ride,speedometer/odometer calibration,ground clearance, and clearance betweenthe body and tires or snowchains. Check that the maximum load of thereplaced tire is greater than 1/2 of theGross Axle Weight Ratings (GAWR)of either the front axle or the rearaxle, whichever is greater. As for themaximum load of the tire, see the loadlimit at maximum cold tire inflationpressure mentioned on the sidewallof the tire, and as for the Gross AxleWeight Ratings (GAWR), see the CertificationLabel. For details about thesidewall of the tire and the CertificationLabel, see pages 334 and 332. Observe the following instructions.Otherwise, an accidentmay occur resulting in death orserious injuries. Do not mix radial, bias belted,or bias−ply tires on your vehicle,as this may cause dangeroushandling characteristicsresulting in loss of control. Do not use tires other than themanufacturer’s recommendedsize, as this may cause dangeroushandling characteristicsresulting in loss of control. Toyota recommends all four tires,or at least both front or rear tiresbe replaced at a time as a set. See “If you have a flat tire” on page365 for tire change procedure. When a tire is replaced, the wheelshould always be balanced. An unbalanced wheel may affect vehiclehandling and tire life. Wheelscan get out of balance with regularuse and should therefore be balancedoccasionally. When replacing a tubeless tire, theair valve should also be replacedwith a new one.